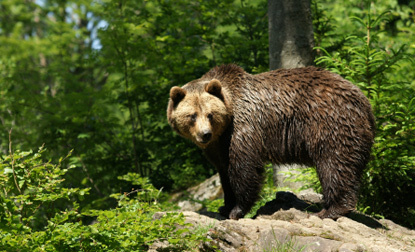 Brown bear on a rock, Bavarian Forest National Park. Together with the neighbouring Bohemian Forest in the Czech Republic, the Bavarian Forest forms the largest contiguous woodland area in Central Europe. Founded in 1970, it was the first German national park. It is also the largest national park in South Germany, covering 247 km². The sparse human presence allowed the wild fauna to thrive. The pristine mountain forests, mixed forests and high moorland are home to wolves, bears, lynx, wild cats, foxes, deer, bisons, wild boars, otters, badgers and over 50 species of woodland birds.